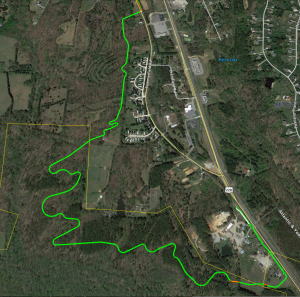 SUMMERFIELD — The engineering firm presented on Tuesday night during the monthly public meeting of the Summerfield Town Council a tentative pathway for 3.7 miles of trail through the Town of Summerfield for the Atlantic & Yadkin Greenway connector. The pathway will also serve as the town’s contribution to the Mountains-to-Sea Trail, a 1,175-mile coast-to-coast trail from the Great Smoky Mountains to the Neuse River. 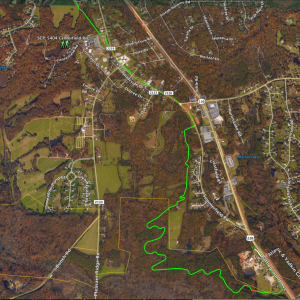 Town Manager Scott Whitaker said work has been stalled in recent months as officials have attempted to negotiate with a family that owns property on the west side of U.S. 220 that would allow a more direct route for the trail. Those negotiations failed, however. Now, the plan is to bring the trail through the U.S. 220 pedestrian tunnel, up beside Long Asphalt Paving Company, across Summerfield Road and behind a mobile park home along Summerfield Road. * The trail then turns north and ends as it enters the new pedestrian culvert under U.S. 220. This image shows the northern section, from a point north of Medearis Street to the point where it will detour away from Summerfield Road. 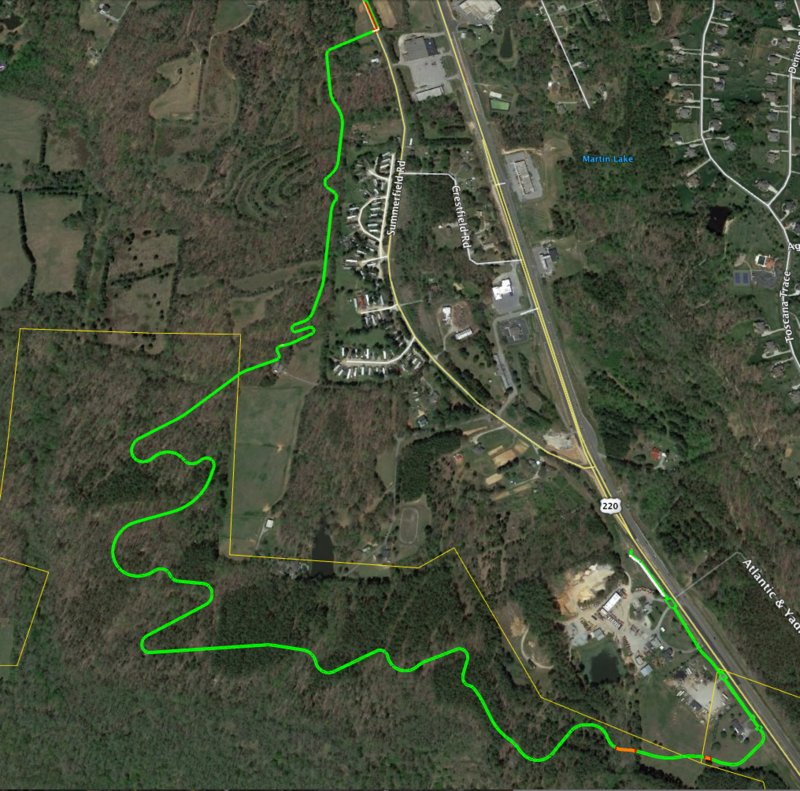 From the northern terminus, future plans will somehow connect the trail on to a property near the Haw River, and then head east towards the Oak Ridge segment. Todd Delk, a representative of the contractor Stewart, said there are eight properties where the town might have to acquire some type of easement or right-of-way. 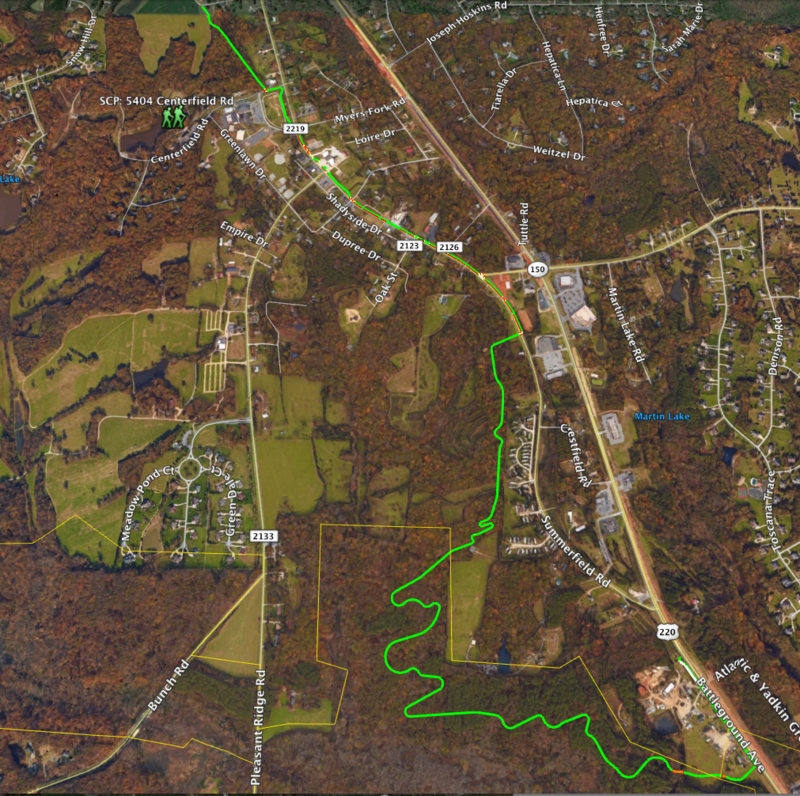 One of those properties is owned by the school, one by Summerfield Fire District, and five other parcels at the southern end of Summerfield Road as the trail winds its way behind a mobile home park. Beyond that, the property is owned by the city of Greensboro and Guilford County governments. “The first thing people want to know is, ‘how is this going to impact me,'” Dunham said. Delk said the project is at 25 percent design. He was seeking approval to move forward to 90 percent on the design phase, but Councilman Reece Walker suggested the town hold an open house on the trail to inform the public. 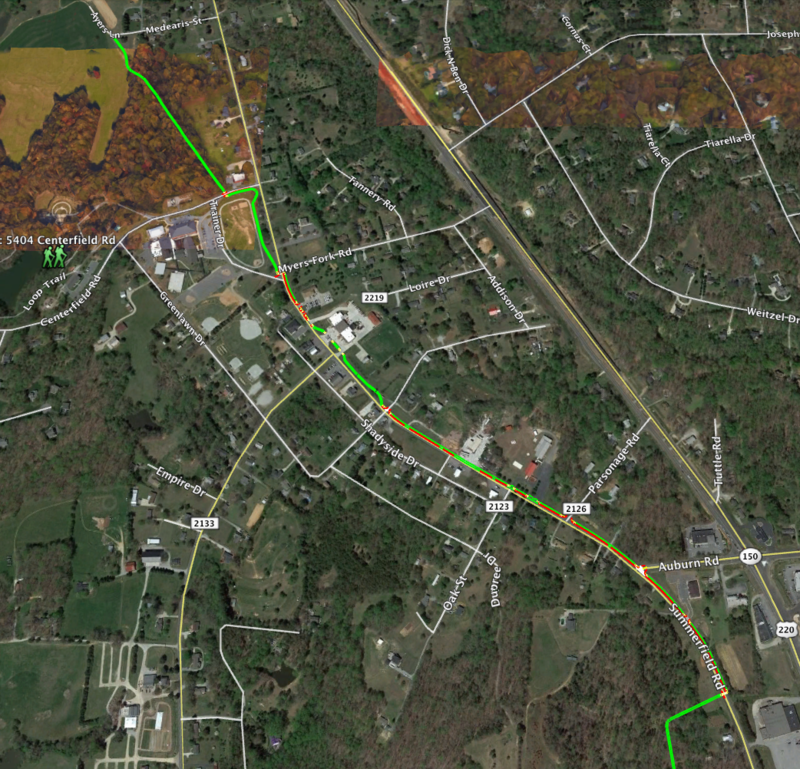 This image shows how the proposed trail will leave Summerfield Road, take hikers behind the mobile home park and towards Long Asphalt Paving Company – then use the pedestrian tunnel to go under U.S. 220 and connect to the existing greenway. Summerfield resident Joe Shelton wondered why the town would show the public. “What happens if they don’t like it? Why show it to everybody,” Shelton asked. Whitaker insisted the tentative plan is “not a done deal” and the town is financially obligated to $389,953 — the design contract with Stewart. Beyond that, there is an North Carolina Department of Transportation allocation of $3,429,000 for construction, which is expected to begin in 2024. That requires a town match of 20 percent, which totals $857,250 (not including the $389,953 for Stewart). Other routes were considered, including crossing U.S. 220 at Strawberry Road. 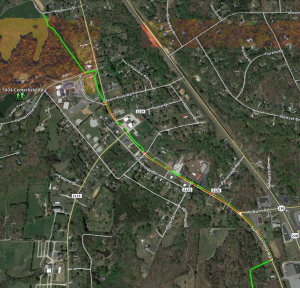 Stewart and town officials shied away from that option, though, after residents expressed safety concerns and NCDOT suggested it might seek partial reimbursement for the cost of the tunnel from the Town of Summerfield. 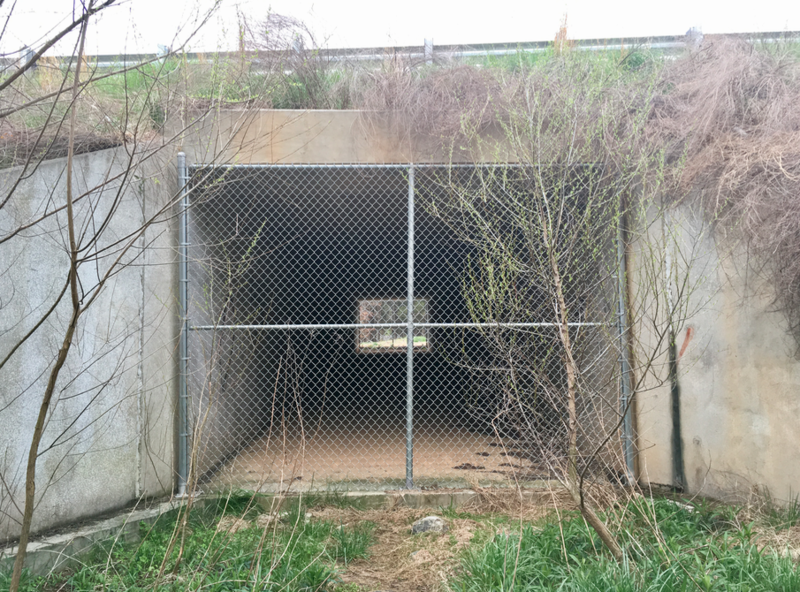 Jason Webster, of the Town of Summerfield’s Trails and Open Space Committee, requested the Town Council to consider putting in a sidewalk to connect the pedestrian tunnel under U.S. 220 to Summerfield Road, which would get trail users off U.S. 220. 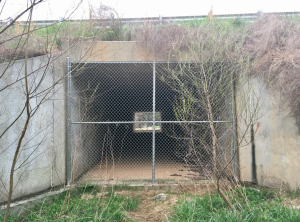 Separately, town Trails and Open Space Committee member Jason Webster spoke during the budget-related public comment period and said the pedestrian tunnel that connects to the A&Y Greenway “is just sitting there” of no use to anyone at the moment. He asked the mayor and council members to consider putting in a sidewalk to connect the pedestrian tunnel to Summerfield Road in the Fiscal year 2019 budget, which begins July 1. The budget process begins in earnest on Monday, April 16 when Whitaker and Finance Officer Dee Hall submit a draft budget. That draft budget has been promised to be made available on the town website. The tunnel is currently blocked by a chainlink fence. It is situated approximately 0.4 miles north of the Anna Long Marshall Wayside parking area. Whitaker estimated the sidewalk, at about 600 feet, would cost up to $70,000. That estimate includes design work. Webster said the only recourse Mountains-to-Sea Trail hikers have right now is to walk down U.S. 220. A sidewalk, even if temporary, would alleviate such a concern. Council members agreed, at Whitaker’s urging, to agree to allow Hall to put the request into the draft budget so it could be discussed. The discussion does not commit the town to anything. The town’s budget is expected to be adopted during the June 12 monthly public meeting.